I was very excited when I got home on Tuesday and saw a parcel from Wiggle- it could only mean one thing! My purple volunteer t-shirt! 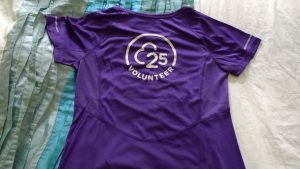 In case you are not a parkrun obsessive (as my dad, who runs parkruns with me, didn’t know about it until I showed him)- once you have volunteered on 25 separate occasions, you become a member of the 25 club, and can claim your (very high quality technical) free purple Tribesports t-shirt. Wiggle distribute them (so you have a link on your profile, and when there are some in stock, it allows you to click through to the Wiggle site and add it to your basket)- they will either charge £1.99 for postage, or if you spend over a certain amount (I think £20) the delivery is free. 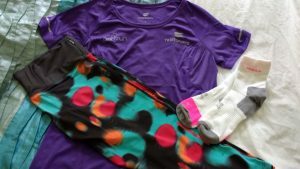 I had a little browse and added some socks, and also some SIS electrolyte tabs as I need to find a nuun replacement as no-where seems to stock it any more. 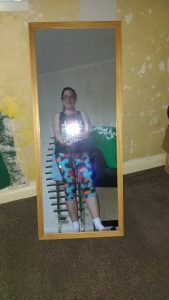 Those things didn’t add up, and then I came across these fab capris! They are Asics (in the sale of course)- I normally like Nike ones but these ones had a nice wide waistband, a big zipped pocket, and I liked the colours. They are very comfy too- I shall be looking at Asics again when I next need/want new capris. I tried to take a picture, and I have since worked out how to turn off the flash, but not at that point! It shows how bad the walls were in my office too after we stripped the wallpaper- many shades of paint, blobs of plaster and no idea what all the white bits were. After completing the 100 miles on Tuesday, I was really stiff on Wednesday- I had to get some paint from B&Q and I ended up leaning on the trolley as I pushed it around as I was having real trouble. Once I got home I iced my back for a long time and that really helped, and then I had a very slow walk around the two mile loop, which helped a bit more. On Thursday my parents were coming over to help paint the ceilings in the bedroom and my office – they came armed with poles, rollers, a tool box, dust sheets… It was a good team effort and we powered through until mid-afternoon, giving the walls in my office a bit of white paint, as we were worried that the walls were so bumpy we would need to put up lining paper before painting. Behind you can see the yellow/brown wall, and then the white coat going over the tester pots and the rest of the wall. I shall save the decorating posts for another day, but they left around 2pm so I headed out for a run then, for a nice 4.5 mile loop. I got home just in time to have a quick shower as we were going to see the new Jason Bourne film at our local cinema- we power walked there and just made it in time! 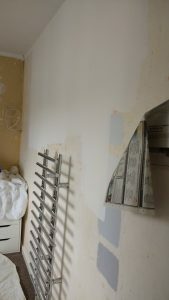 On Friday my dad had said he would come over and help with some more decorating- we did a bit of painting and then a lot of sanding down the walls, cleaning with sugar soap, and then painting the walls white to give them a base coat. We didn’t stop until around 4pm, so I had a snack and then headed out just after 5. This was not such an enjoyable run as I think I was a bit thirsty, probably still hungry, and had eaten too close to the run. 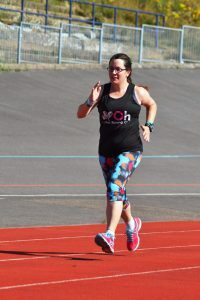 But I wasn’t going to parkrun on Saturday so did 3 miles there instead. Saturday was a rest day, as much as walking around London all day is resting, and then on Sunday we had a track session. Our club are trying to do one a month (followed by brunch), and now we have moved I can run there- it’s just under 2 miles away. We did some warm ups and balance exercises, and then some drills including running through these ladders- we have them at school but normally it’s the kids that use them! 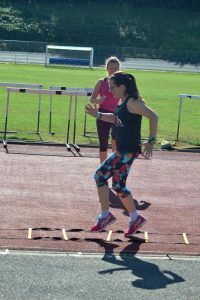 We then did some intervals- 100m then rest x4, 200m then rest, x3, 300m, then rest, x2, and then a final 400m (trying to do a negative split, but it was hot!). There were even a few photos with both feet off the ground! Very exciting! 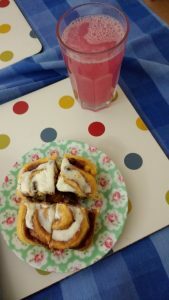 I could not go to brunch as my auntie and uncle were coming over for a look around our house, so after it finished I ran the mile or so into town, and picked up a cold drink and breakfast in Starbucks, and then briskly walked home- all in all 5 miles run and one mile walked- not bad for a Sunday morning. A cinnamon roll! Good compensation for missing out in brunch. 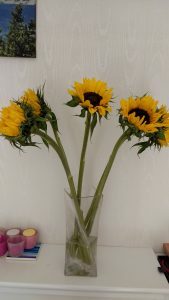 My auntie brought over these lovely sunflowers, so they have been brightening up our living room. After a little tour of our home and a catch up, they were off and we had to be heading back into London again. Anyway, that run meant that my final total for July was 116 miles! That is my second highest mileage ever, beaten only by my final month of marathon training last year! Not too shabby! My medal has been dispatched so I can enjoy it soon! If you volunteer at parkrun, which role is your favourite? I think the only role I didn’t like as much was token sorting, mainly because it was a freezing cold day and I ran first, and so needed a few more layers than I had with me. I love cheering people on as a marshal, and I like token scanning as you get to see all of the runners come in. But things like tail running or new runners briefings are good “two for one” roles as you get to run at the same time. Are you a decorating fan? I don’t mind the actual painting, but all of the moving furniture and preparing seems to take a lot longer, and it’s a while before you can see any difference.